To celebrate the introduction of the newest version of Android, called Ice Cream Sandwich, Google and Samsung introduced the flagship Ice Cream Sandwich phone Tuesday evening, the Galaxy Nexus. Continuing Google's naming culture where "Nexus" represents the most cutting-edge Android phones, the Galaxy Nexus offers impressive hardware to back up the impressive Android software update. With a 4.65” (1280 x 720) Super AMOLED display, a 1.2GHz dual-core processor with 1GB of RAM and 16GB or 32GB of internal storage, a 5 megapixel LED flash camera and a 1.3 Megapixel forward-facing camera, the Nexus S will be available in two flavors of 4G: actual 4G (LTE), and "4G" (HSPA+). The difference in radios means the HSPA+ Galaxy Nexus is slightly thinner and lighter of the two models, with an 8.94mm profile and weight of 135 grams. Other wireless features include Bluetooth 3.0, 802.11 a/b/g/n with N in both 2.4GHz and 5GHz ranges, and Near-field communications (NFC). Additionally, the Android 4.0 wireless stack supports Wi-Fi Direct, the Wi-Fi technology that lets two client devices connect to one another without the need of a wireless router between them. It's essentially everything that was predicted earlier today by blogs based on a conflation of various leaks. 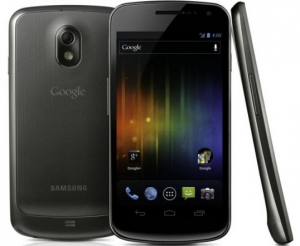 The price of the Galaxy Nexus has not yet been listed, nor has the precise launch date, but both Google and Samsung have said that it will be available in the U.S., Europe, and Asia beginning in November, and later to other global regions.